To start a download, you must first find a .torrent file. These files are very small, and contain meta-data describing a much larger file to be downloaded from other peers. There are millions of these .torrent files available on the internet, and on this page we will show you some easy ways to find them. Once you've obtained a .torrent file, you can easily open it within the Tixati software by clicking the 'Add' button. After the .torrent file is opened, Tixati connects to other peers and starts downloading the file automatically. The downloaded files are left in a convenient 'Downloads' folder on your desktop. Where do I find .torrent files? 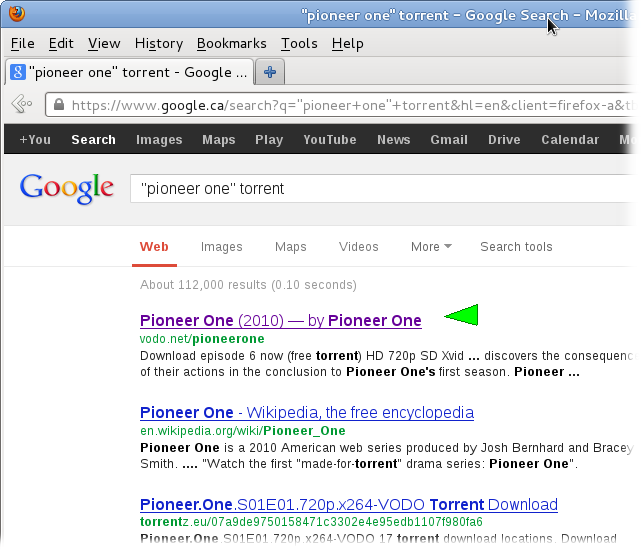 There are many easy ways to find .torrent files on the internet. Many torrents can be found by using regular web search engines such as Google or Yahoo, but there are also specialized 'Torrent Sites' which only deal in .torrent files and usually offer organized categories for you to browse. As with any other internet tool, such as your web-browser or email client, it is your responsibility to comply with your local copyright laws and other rules and regulations. Note that we put the title of what we're looking for in quotes, this makes sure we only match the complete title instead of each word individually. Also note that we've added the word 'torrent' to make sure we find pages that are likely to have a .torrent file available to download. It looks like we've found a .torrent file corresponding to the item we're trying to download. Let's click the link to the .torrent file. If Tixati is listed with the 'Open with' option, simply choose that option and click OK. Tixati will then automatically start downloading the file. Be patient for the first few minutes of the download. It often takes a small amount of time for the download speed to ramp up to it's full potential. The file may take a while to download depending on the final size and how many other peers are in the swarm. There are also many other factors such as the speed of your internet connection that can effect the length of time it takes to download a file. If you are having difficulties downloading a particular file, it may be because there aren't many other peers in the swarm. Please see our Troubleshooting Guide for more information. "Seeding" means you are no longer downloading but you are still uploading pieces of the file to other peers. Once this happens, you can stop the transfer at any time by right-clicking it and selecting 'Stop' from the pop-up menu, although it is very helpful for other peers if you continue seeding for as long as possible. You can find the complete file within the "Downloads" folder on your desktop. We hope this mini-tutorial has helped you find content to download. If you are having any problems, please consult the Troubleshooting Guide for more information. You may also want to browse our Optimizing Guide for other tips and tricks to get the maximum amount of download speed from Tixati. Click here to return to the Tixati.com homepage. Click here to download Tixati.